Principles of Integrated Marketing Communications explains the principles and practice of implementing effective IMC using a variety of channels and techniques. It equips readers with the knowledge to develop sophisticated marketing campaigns for contemporary business environments. 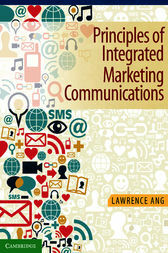 Designed to introduce readers to IMC in an engaging way, this valuable resource: • Covers the latest concepts and tools in marketing and communications • Presents topics in light of their underlying theories and principles • Includes case studies adapted from recent, real-world examples (drawn from both Australian and international contexts). Each chapter contains a 'Further thinking' section, giving readers the opportunity to extend their understanding of the conceptual and historical underpinnings of IMC, and teaching them how to analyse and overcome problems when devising an IMC strategy. Each chapter also includes learning objectives and review questions, to reinforce knowledge. Additional material - including extra case studies and topical multimedia files - is available on the companion website at www.cambridge.edu.au/academic/imc.